A damaged clay tablet discovered in the late 1800s in Sippar, Iraq is said to be the oldest map of the world. It was discovered on the banks of the Euphrates River, and published in 1899. Now housed at the British Museum, the damaged clay tablet dates back to 600 BC, and depicts an early interpretation of the layout of the world. At 122 x 82 mm, the small map gives us a glimpse into how the Babylonians viewed the world around them, both physically and spiritually. The tablet contains a map of the Mesopotamian world, with Babylon in the center. It contains carefully etched images and cuneiform writing. Babylon is surrounded by two concentric circles that represent the ocean, named “bitter water” or the “salt sea.” It is labeled with Babylon, Assyria, and Elam. Eight triangular areas labeled as “Regions” or “Islands” surround the Salt Sea, and are labeled with distances, descriptions of the regions, and descriptions of great heroes and mythical beasts that lived in each region. The southern marshes are indicated at the bottom of the map by two parallel lines, and a curved line near the top shows the Zagros Mountains. The Euphrates River is shown running from the mountains above, through Babylon, to the marshes below. Within the center of the map are seven labelled areas that appear to represent cities. Due to damage of the tablet, it appears that three islands are missing from the lower corner. 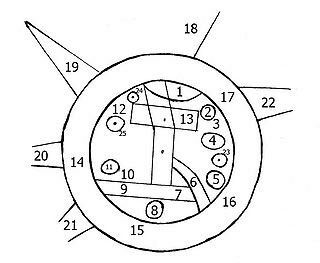 The below sketch shows a detailed outlined of the map and a key is provided showing the labels of each element.